I love having a cat eye. Since September every morning, I add on a flick. It really emphasises my eye, makes it look bigger and adds character. So many people find it very difficult to get the perfect flick, mostly because the idea in their head and the image they're following are completely different. I was watching Dragons Den and was introduced to this amazing idea! 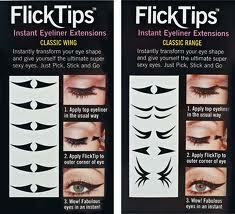 Flick tips is a new company that sell adhesive flicks you add to the end of your liquid liner. You can reuse them and they stay on all day and night. (Unfortunately she didn't get an investment) Well Dragons I love the flick tip. 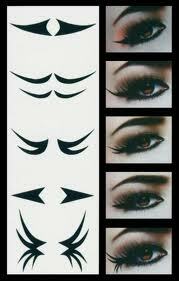 I prefer the sheen of eyeliner and how it moves with the skin, but I can't wait to try these. Has anyone used anything similar? Saw these on Dragon's Den too and thought they were mad not to invest. So clever and simple....love them! They are great, can't wait to try them! Definitely great for people in a rush! these sound like a great idea! its always hard to get the perfect flick on the end of my eyeliner. great post!